A few years ago, a friend of mine did those home parties selling those prepackaged food mixes and you would add one ingredient, maybe two and then voila, you had food and HEY! YOU COOKED. Beer bread was always my favorite – you’d get this box mix and you could add 12 ounces of beer or soda and then it was bread or cake or whatever and it was SO FREAKING GOOD. But frankly, the thing about box mixes is that you really don’t know what the hell is in ’em. I stopped making boxed cake mixes long ago – and really? No boxed cake can beat a cake made from scratch. Don’t even try to argue. I frequently rip recipes for beer bread out of magazines…but hadn’t made one. I kinda suspected that it’d be like cake – not that tough and worth the work. But I couldn’t make up my mind so over two nights, I made two different recipes. 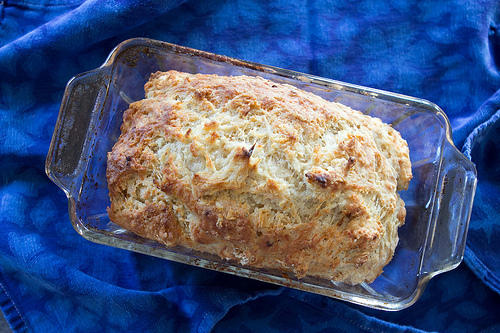 The first night, Beer Cheese Bread from Cooking Light magazine. This one starts by sauteeing onions and garlic in some olive oil before adding it to the dry ingredients and adding the beer and Monterey Jack cheese – combining the ingredients and baking – pausing twice to add some butter to the top. Remember, that even with the cheese and beer and butter, this is a Cooking Light recipe so you can probably eat the whole loaf at once and be totally okay. We didn’t quite eat the whole loaf in one sitting. This is excellent when served warm, and it would taste AMAZING alongside a hearty soup. Then again, I heated up a slice and ate it solo for dinner tonight. It’s kinda filling. The second recipe, Basil Beer Bread, was from Real Simple magazine. I couldn’t make this yesterday because our local grocery store is stupid and didn’t have basil. 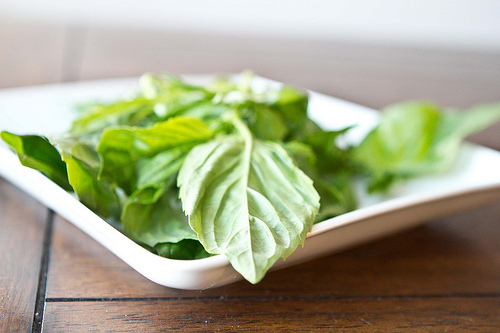 I mean, WHO DOESN’T HAVE BASIL? The flavors here were different, obviously. 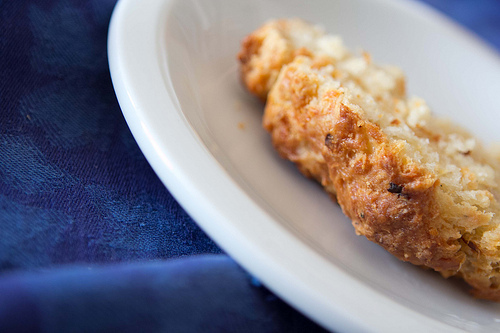 Instead of jack cheese, parmesan was the required cheese (YUM). Also, basil adds an amazing flavor – and would have been perfect if I had chopped the basil up tinier (To be fair, I was in an awful mood and didn’t want to accidentally slice my finger). Unlike the other recipe, this one called for yeast – but… it didn’t require time for the yeast to work it’s mojo, which I’m guessing has something to do with the beer. The downside is that you really have to be careful when baking yeast breads to make sure they cook long enough, otherwise they don’t taste QUITE right and are squooshy. This bread has an excellent flavor and was delish – but could have stood a few more minutes in the oven (also, my cookie sheets are “weathered” – that’s my nice way of saying that they are totally beat up and I could use some more parchment paper). My spinachy-looking basil isn’t the most attractive thing (SLICE IT SMALLER, PEEPS. 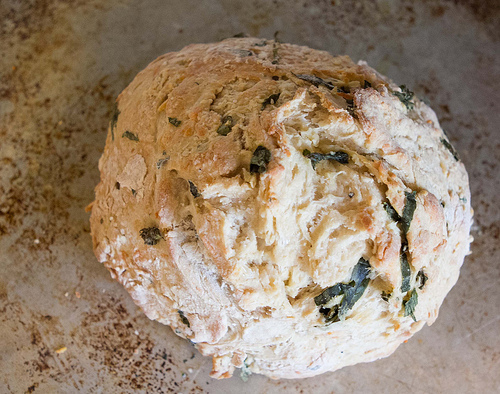 I don’t even know how to cut basil, I admit it), but this bread would be a great accompaniment to a pasta with a meaty sauce, perhaps, or maybe even to bring together a meatball sandwich. Both of these savory breads are definitely going to be made again. I’m not sure what I believe in. I’m not sure what I believe, but I believe in signs. I believe sometimes the universe tells you things and it’s your job to figure out just what the universe is trying to say. This is hard, because you know, the universe doesn’t exactly enunciate or… speak. The universe, at best can be described as using some funked-up cosmic form of semaphore or smoke signals. Interpreting the universe requires a bit of thought, more than most people like to do. Okay, fine, more than I sometimes like to do. Coincidence? Oh, most likely. But sometimes it feels like a message from the universe and when the universe talks, it’s worth a listen. I had dropped my daughters off with my mom this afternoon so I could grocery shop. I was driving north on a two lane road. I was going the speed limit, or possibly slightly under (I’m an annoying driver, I admit it) and I was approaching an intersection. Running north-south, the intersection has a blinking yellow light. East-west, a blinking red. As I approached my blinking yellow, a burgundy car was stopped, but as I got nearer to the intersection – the intersection that did not require I stop – the car began to proceed through, heading east. In an instant my foot flew from the gas pedal to the brake and I slammed hard, but I quickly saw that even with immediate braking, I was still going to hit that car. I would plow right into the passenger side of the vehicle at about 45 – 50 miles per hour. My brain flashed again and I swerved to the left to swing my car around behind the burgundy vehicle to get around it. I narrowly missed colliding with any part of the burgundy car. The driver of the vehicle continued to head east, and I pulled over as soon as it was safe and put my hands to my face and sobbed. I kept thinking the driver would turn around, come back, say sorry, but nothing. I turned the radio off, and cried into my hands until the tears were gone and I felt like I could drive again. Had my brakes not worked at all, we would have definitely collided. Had there been a car oncoming in the south bound lane, I’d likely have been in a head-on collision when I swerved. Had the girls not been with my mom, surely they’d have been terrified, even if nothing had happened. And maybe the biggest consequence would only have been a smushed car, but things easily could have turned out differently this afternoon. So what is the universe trying to tell me? I’m not entirely sure. I feel pretty lucky today, though. And in the massive sea of things that don’t feel right to me right now, in the chaos of change and adjusting where I’ve had days where I’ve felt ANYTHING but lucky, you know what? I’m still here. I’m here and every day is mine and even the bad days are mine and I can do the best I can with each one of them. And maybe the Universe just wanted to remind me that some people are awful drivers, or that not everyone looks before proceeding through an intersection, or maybe I should be wary of those driving burgundy cars. I don’t know. What I’m taking from it, though, is that I’m still here. Despite the yuck. I have all this opportunity with every day I have to appreciate it, even if only a little bit. Perhaps I’m reading a bit too much into it, but then again, that’s what near misses are for. Much like your entrance to the world seven years ago, you still barrel into each day like you’re in a hurry. You begin each day quite early – that has yet to change! – and your face is one of my favorites in the morning because you greet the day with peace, smiles and you welcome it, the new day, with joy and with eagerness to get started (preferably with a cup of chocolate milk and a bendy straw). 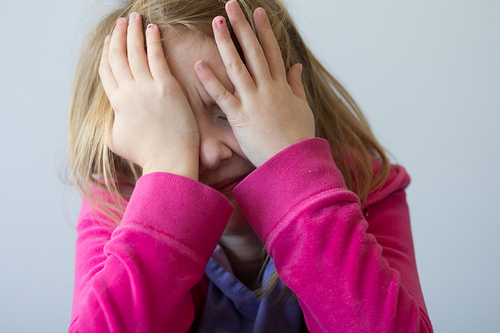 You finished first grade this year and soon you’ll start second. You’re ready. You took the world by storm this year, mastering reading skills – so much that like your sister, you’re above your grade level. But rather than read, you mostly like to write. You create these stories, scrawled on blank sheets of paper and illustrated in marker. Your stories of animals and Hawaii and doughnuts. I get amazed at your creativity – and I love that about you. The other day I asked you where all the time went, how you got to be so old already. Your reply was, “I don’t know. I’m not Google.” You are hilarious, and you are finally getting the nuances of humor and puns and telling jokes. It’s not that I didn’t love your made up jokes – but as you get older, your jokes get funnier. You get funnier. You love to make people smile and you love a new audience and you are charming and charismatic and you are an entertainer. You still love animals – still really love dogs. Your latest thing is that you have cleaned your room super clean because you want the dog to come sleep in your room. You would be so happy if he would curl up in your bed and sleep next to you at night – but he won’t do it and I’m sorry he doesn’t because your room is the cleanest it’s been in a long time. You make these lists for me, songs you want me to download and burn to CDs so you can dance around to them. You’re pretty partial to top 40 and you said last week that you really like “THE Maroon 5” (the THE about it is what cracked me up). This summer you really liked Train’s “Drive By” and I love it when I’m driving and I look back in the rear view and I see your face and you are singing unabashedly and I envy your carefree nature. You are a free-spirit – you really don’t seem to care too much about what other people think and my god, I hope you don’t lose that because it’s pretty amazing. You are so loving. And maybe, just maybe, I say that every year, but you are the first person to sense when I need a hug and you often give them freely. I sure do love when you wrap your arms around my neck and squeeze me into a hug. When you were younger, when I would kiss your cheek, you would hold your hand over the spot where I kissed you to “hold the kiss in” and occasionally you still do that and it melts me these things you do that you have hung on to over the years. You are affectionate and lovely (however, you don’t always love having your picture taken, as seen above in that picture! Sorry, kiddo!). When I drop you off at school, I stand on the sidewalk and watch you walk in and marvel at your self assurance and how OLD you are and you turn around and look at me and raise your hand in the ASL sign for I love you before turning around to continue to walk back in. Once you enter the building, I always get back in my car and catch my breath and smile at the very thought of you. This year brought us your fascination with SkippyJon Jones (holy frijoles! ), your first time spending the night at a friend’s house, your first time inviting a friend to sleep over, you deciding you want to try gymnastics lessons like your sister (you seem iffy so far, but you’re getting better already). You often ask if you can go see if your friends can “hang out” and you sound so old. Not sure how I got so lucky, but I am so very lucky to be your mom. 1. I am typing this edition of the Thursday Ten on a netbook. I never ever use my netbook – mostly because I have huge gigantic manhands but here I am, using the netbook and I feel like a giant using this tiny mini little bitty thing. 2. What IS it that Java is always wanting to update? DAILY, y’all. What does it change daily? 3. I feel tremendously old, tired and run down this week – and I feel like it shows. I feel like my eyes are weary and heavy and that I have aged a hundred years in the past week and a half. Certainly that can’t be true, but am grateful for filters in Lightroom. 4. Seven years ago today I was really sick of being pregnant. Tomorrow is the Pumpkin’s birthday and I’m gearing up for her birthday festivities. This may be a more low key year than most, but I am still very very excited to celebrate the day she was born. I love birthdays – especially the birthdays of my kiddos. 5. 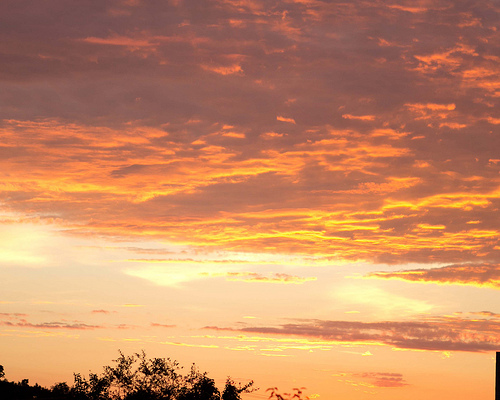 There was an amazing show in the sky the other morning – I love the colors and how beautiful the sky can be. Surely, my neighbors are used to me standing in the driveway in my pajamas with my camera taking pictures of the sunrise. 6. I got invited to an event via Facebook the other day by a woman I went to high school with. I had actually just walked past her in a public place last week – neither one of us said hi to each other (and we’re “friends” on Facebook why?). It’s a weird thing, Facebook. And it’s a weird choice of terminology… “friends”. Anyway, totally not going to her Tupperware party or whatever it is. 7. I’m having fun with my Kitchen Through the Lens project so far. I think I’m going to have to give myself more time for the next project. I come home after work and get busy trying to make SOMETHING, and I feel like I am rushed and just want to HURRY HURRY HURRY and finish so I can eat. And that kind of defeats the second half of the project which is to really work on the photography side of things. I need to sloooooow down. I’ve yet to decide what to make next week. What do you think I should make? 8. New music this week? Not much. Tristan Prettyman’s new single “My Oh My” was released so I picked that up. I like her – she’s mellow and acoustic-y and generally pretty positive and so while this isn’t my favorite TP song, I do like it. 9. Tonight, I bake a cake. A doughnut cake. My legendary cake. I’m kind of looking forward to that. Mostly because cake sounds really good right now. As does cake batter. 10. The Princess and I have been re-reading children’s stories at bedtime – older books, books far under her reading level. We started earlier in the week reading “Goodnight Moon” together and we followed the next night with “Harold and the Purple Crayon”. It makes me smile, revisiting these books with her. She hasn’t wanted to be read to in so long. The stories we’re reading are fun, and revisiting them is a fun little regression. I still love children’s books – so I hope she hangs on to that also. Despite my lack of total enthusiasm with last week’s baked lemon pasta, I decided that when you fall off the horse you really should just stop being so freaked out by your kitchen and get right back up on the figurative horse, even if your ability to eat dinner that night depends on it. I even went so far as to decide that just because Ree kinda let me down a little bit with her stroganoff-y pasta recipe, that doesn’t mean that her salsa recipe won’t be any good and I should just give her one more chance to prove herself (as if she’s begging. I’m pretty sure she’s kinda doing okay on her own without me chairing the fan club). I actually chose The Pioneer Woman salsa recipe specifically because of how the recipe stated that salsa shouldn’t necessarily be chunky like a pico de gallo and AMEN TO THAT. Sure, I coulda taken ANY recipe and pulsed/pureed/squashed it into the right consistency, but I figured, Let’s start with the recipe of someone who has the same salsa philosophy as I do. I think salsa is such a personal thing. Is that a nutty thing to say? By the time I was done with this recipe, I had veered a little bit beyond the stated quantities – and tasted and added more of and tweaked and improvised that while it was still salsa, it was salsa almost the way I like it. I say “almost” because frankly, I got too hungry, figured it was good enough and just sat down with a bowl of it and a pile of chips bigger than my head. For example, there are people who don’t love cilantro. They say it tastes like soap. I love cilantro. 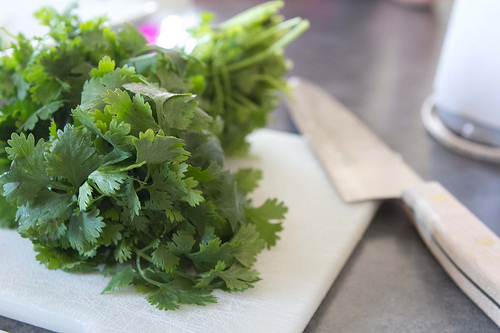 I don’t love it to the extent that I’m going to garnish birthday cakes with it or incorporate it into every dish I make – but there is a definitely time and a place for cilantro and it definitely makes certain things better. I’m pretty sure I more than doubled the cilantro. And maybe added a teensy tiny bit more sugar. 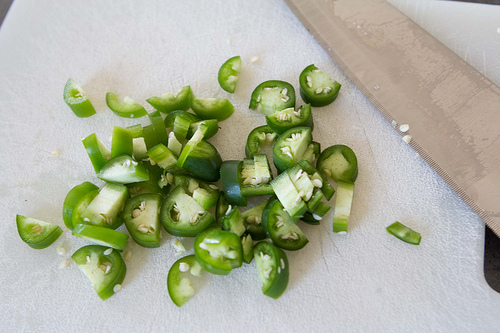 But not more jalapeño. This shizz was spicy enough. When my grandmother died several years ago, I inherited her decades old Cuisinart food processor. Literally, that sucker was probably my age and she had used it for years. It was a lovely and wonderful addition to my kitchen while I had it. I think of it kind of like that song, “My Grandfather’s Clock” – when the clock basically stops working when the old man died. I had that food processor for maybe a month or so before it stopped working. A month of beautiful creamy cheesecakes, and finely chopped cracker crumbs. It was amazing. And then…pffffft. Stopped working. SURE WOULD HAVE BEEN NICE TO HAVE A FOOD PROCESSOR LAST NIGHT FOR THIS SALSA EXPERIMENT. Especially because I didn’t really read just how much salsa this would make. 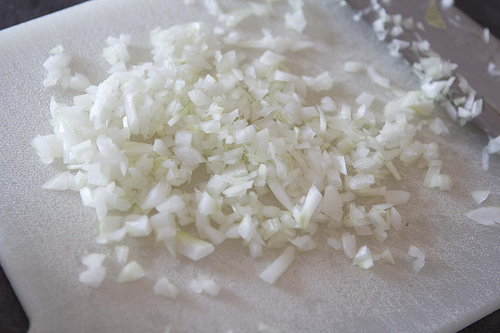 No matter, my blender kinda sorta did the job okay (Hey, you like big chunks of onion, right?). Buuuuut… someday I will have a food processor again because I think they’re worth it. The kids hated the salsa – thought it was too spicy. Me, on the other hand? I’ll probably be eating salsa for awhile since I made a bucket of it. 1. Project Runway is back, something that I managed to forget about until about 9:25 – so I missed the first few minutes-ish. I am typing and soaking in some Tim Gunn. Love him. 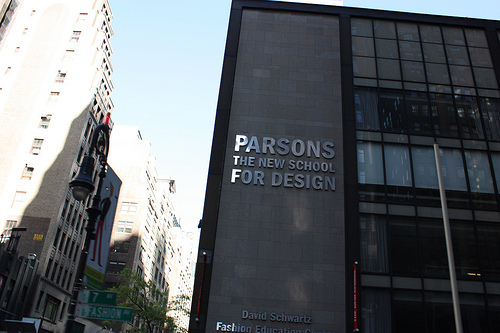 Yes, I took a touristy picture of Parsons when I was in NYC a few years ago. 2. Make it work. Not just a Tim Gunn saying, but not a bad life motto either. This week has been a roller coaster, and I’m really working to end it on a good note somehow. I have no idea how, but… I’ll try. 3. It finally rained today and temperatures broke and now at the end of the day, I’m in jeans and a hoodie and this is what weather should be ALL YEAR. I’m waiting for my lawn to stop feeling like needles. 4. I think I will aim a little lower for next week’s cooking project – and make salsa (thanks Mel!). And then pick up a bit more mint and give mojitos another go. I really love salsa. 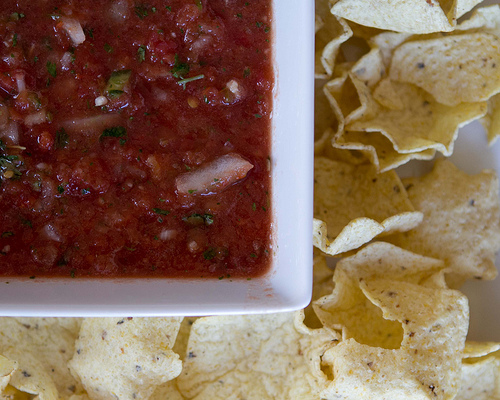 Give me a bowl of salsa and a spoon and I’m a happy camper. 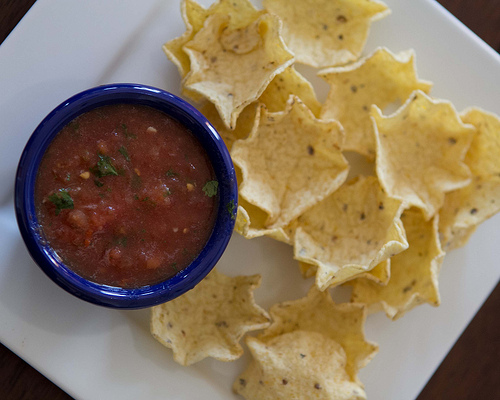 Do you have a favorite salsa? 5. So, who’s going to see Dark Knight Rises tomorrow? 6. Being a gymnastics mom can get a little rough. After mangling her shoulder last week, The Princess banged her shin this week while working on a stunt on the bars. Poor kiddo. That was a pretty ugly goose egg type bump on her leg. 7. Just over a week til Pumpkin turns seven. Actually having a birthday party for her this year – I hope the weather cools down enough to bake a cake. 8. I’m a little sleep deprived lately. I have been through a lot of stress in my life, but lately takes the cake. I’ve been working on this post off and on for over an hour and listening to the soundtrack from “The Girl with the Dragon Tattoo” and I’m getting sleepy. I’m hoping I can turn off my brain and sleep. Even just a little. 9. 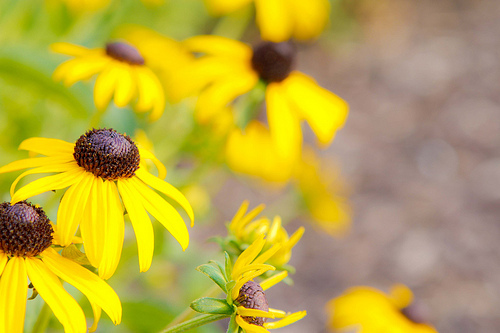 Black eyed susans are one of my favorite signs of summer. Aren’t they joyous? 10. I got a lemon zester from my best friend the other day, because when life hands you lemons, you know… zest the hell out of them. Or something. It’s a pretty badass zester. 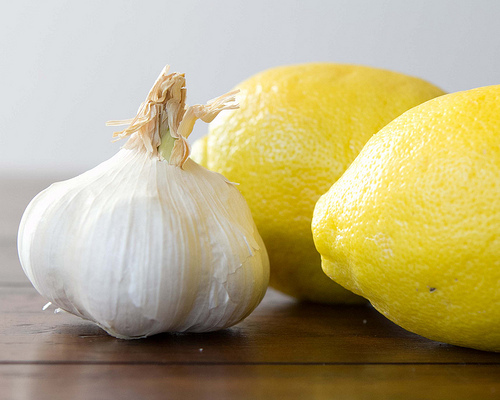 I used it for my lemon pasta and NOW I WANT TO ZEST EVERYTHING. I admit – I didn’t want to cook. The Princess was at a friend’s, Pumpkin was birthday shopping with my mom and the thought of going through the production of making dinner for myself was not something I was getting too enthusiastic about. I mean, hell, it takes about twenty seconds to pour a decent bowl of Cheerios. I LOVE CHEERIOS. But I did it, y’all. And in the midst of the process, The Princess came home and helped me cook and it was lovely fun, just me and my oldest in the kitchen. 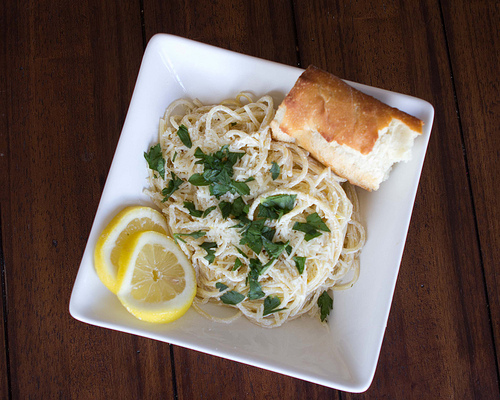 I had seen someone post pictures online a few weeks ago of their version of lemon pasta, and I wish I had thought to grab the recipe at the time. Instead, I used the recipe from The Pioneer Woman – and I have to say, that… well… I’m not entirely a fan. 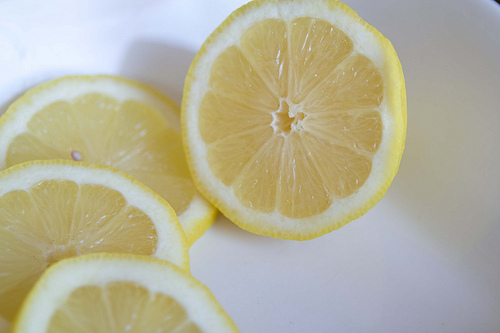 I hear “lemon” and I think crisp and light, and this recipe probably could be with some modification – maybe cut that sour cream in half, and use butter OR oil and not both. OY. 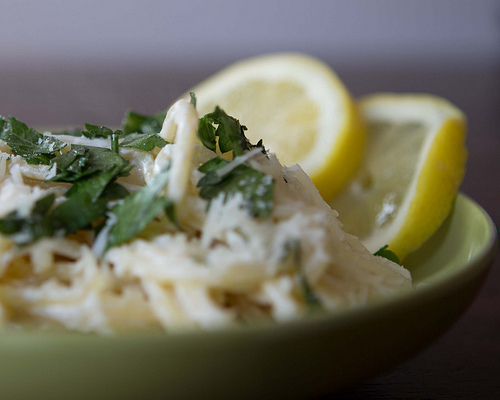 But don’t cut out the parmesan because YUM, also the salt is crucial to balance out the sour of the lemon. The sour cream gave the dish kind of a stroganoff kinda feel to it – which to me screams fall/winter comfort food and not 104° heat index. I didn’t feel like cooking and I DID IT. I did. Would I make it again? Hmmm, not this recipe. I would love something lighter. As it was, by the time I got done I really didn’t feel like eating. I had a few bites of the pasta, some of the warm french bread and bundled the rest up and shoved it in the fridge where it will probably stay until the end of time or until I run out of food storage containers and have to clean the leftovers out. Now which recipe should I make next week? 1. My friend, Erica, mentioned the other day that I hadn’t enabled any functionality to share my posts (Isn’t everybody already reading already?). She then swooped in and got me all set up nicely – she’s a kickass WordPress guru and hey, now you can share my stuff if you want to. I suppose that means I should try to be interesting now. 2. 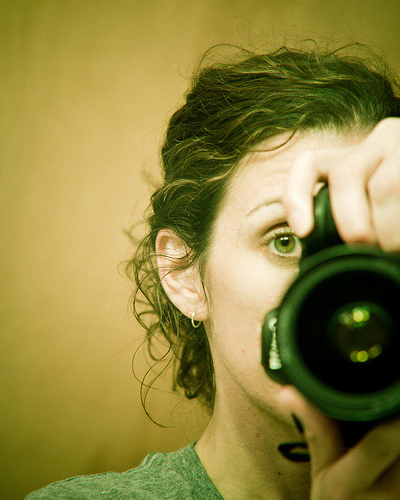 For those who stopped by and commented on my photography post the other day… thank you! I love how many of my favorite people are also such visual and creative beings. I wouldn’t trade my creativity for the ability to calculate a waiter’s tip without using a calculator. Give me my right-brain any day. 3. Musically, this week I had more than one person talking about St. Vincent – so I’ve downloaded some of her stuff. But really, I’ve still been listening to a lot of Alabama Shakes. This is “Be Mine”, though if you want to listen to more, I also really love “Hold On”. 4. My sister is now working in the same building where I work. I was able to meet her for lunch yesterday and it was kind of a nice diversion in the middle of the work day. Lately, we never seem to be able to catch up without kids all over the place – so we walked and talked for 30 minutes on our way to and from lunch. It was a good thing – and it’s something I hope we do more frequently. 5. This past weekend, I had my friend take photos of me and my daughters. I’ve never had a formal portrait done of the three of us and I’m kind of eager to see how they came out. The cobblers kids have no shoes, the photographer has no pictures of herself with her kids. Changing that. 6. I’ve decided to do a new project to incorporate my lack of cooking skills with my desire to improve my food photography skills – by making a new food/dessert/beverage each week for 50 weeks, and TAKING PICTURES OF THE PROCESS AND END RESULT. My list so far has 40 items – including: potstickers, a burger (never made one. Shut up), homemade salsa, cream puffs, and lemon pasta. I need TEN more items. What should I make? I am actually not sure if I’m more excited about expanding my cooking repertoire or flexing some photography muscles (or both? ), but I think it will be a fun thing to do and really will force me to step outside of my comfort zone a bit on occasion. 7. Today I have lunch plans that include tacos and dinner plans that don’t include cooking (as well as seeing a friend I haven’t seen in ages). Thursday is pretty amazing for my belly. Oh, and I won’t be working out. So… uh, Friday, double cardio? 8. Gymnastics strikes again. During Monday’s four hour practice (FOUR! HOURS! ), The Princess injured her shoulder doing a back walkover. There was no bruising and she appeared to have full range of motion despite extreme discomfort with some movements. With ice and ibuprofen, the pain seems to be lessening, but if it doesn’t continue on this path to healing she’ll have to go to the doc. I have to admit, these gymnastics injuries freak me out a bit – not that there’s been anything severe, but the potential is there. Her former coach, barely 20 years old, has already had hip surgery. Chew on that, would ya? A little scary. 9. Because this post needs a picture. 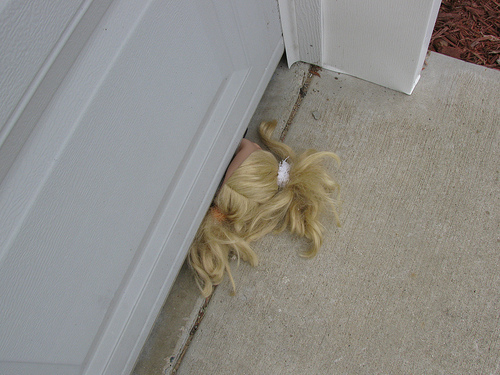 Sometimes you accidentally shut the garage door on a doll’s head. Clearly when I shot this, I knew both of my children were safe in my car… and then when I realized that the doll didn’t quite make her way to safety I had to take a picture (and then I rescued her). My caption when I posted this was: “I always make sure my kids are out of the way. I don’t always check on their toys.” Sorry, doll. 10. The Princess was flipping through the channels last night (I haven’t mentioned Pumpkin this week, but she’s been around, I promise!) and stopped at “Toddlers & Tiaras”. This is her new obsession, I guess, which I’m not sure is any better or worse than Cupcake Wars. I watched her watching incredulously and I turned to her and said, “Aren’t you so SO glad I never did this to you?” She replied, “Well, you could’ve given me a tiara, but NO WAY would I want to be in one of those pageants.” Later, as we were watching a four year old with a stripper pole in her room being told by her coach to do a “booty pop”, I turned to her and said, “You can rest assured that booty pop are two words you’re NEVER gonna be hearing from me.” I think I saw a little flicker of relief.